It also pronounces the words in four different voices. A few implementation notes after the break (screenshot). The tool is a little React app. Its bones are generated by create-react-app. It also uses a wee additional tool I call CRAFT (Create React App From Template). More about these here. The Italian words I found on Wikipedia, neatly divided into sections and tables. Just as I opened the browser console to start hacking on a script to scrape these tables, I remembered I already have a tool for that! The process wasn't completely lacking manual intervention, but relatively painlessly I got a nice chunk of JSON files, one for each category of words, check'em out. The cute part about this tool is the pronunciation of the words. For this, I reached to the help of MacOS's say command-line tool. This tool comes free with the OS and you can tweak the voices in your Accessibility preferences (short post about all that here). I thought I'd write a script to loop thought the JSON files and then say each word of each file with each of the 4 Italian voices that are available. ... then Federica instead of Alice and so on, for each of the 4 voices. And you end up with voices/Alice/soprano.aiff audio file. Let me know if you do something with this. say -v Stoyan Ciao cari! Thanks for reading! Enjoy the flashcards and say and all that. Thanks to Marcel Duran's tweet I figured I was living under a rock and missed out on all the fun that is the Web Speech API. So for browsers that support that API which is a lot of browsers, people don't need to download MP3 and the whole say jazz is unnecessary. These words can be generated in the browser. Yeweeyeye! Yaw! Yeet! Cool. Turns out in Safari there's no onvoiceschanged. But getVoices() appeared synchronous in my testing. 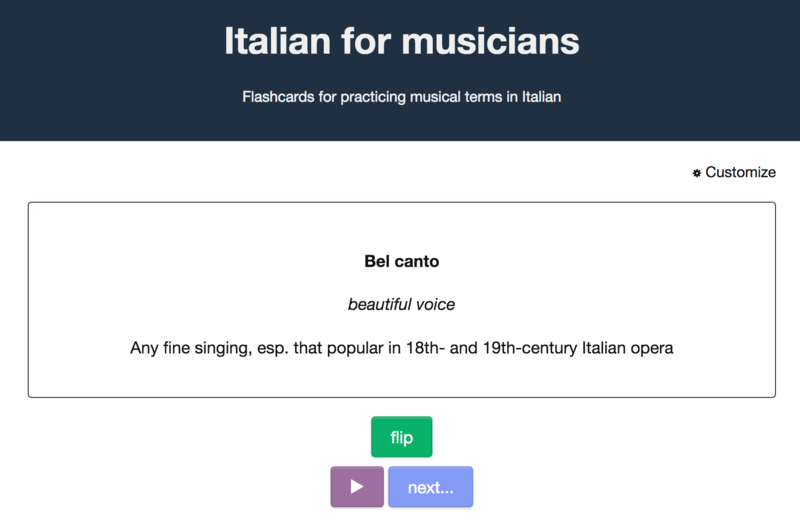 Now webvoices is my array of Italian speakers and I randomly pick one every time you hit Say. If webvoices is still null, I fall back to what I had before. Awesome! Here's the diff and the Safari follow-up.